Did you know using an emoji in the subject line of an email increases open rates? A few years ago, this was unheard of, and using emojis regularly in customer communication would have made the user seem silly and unprofessional. However, recently, it has started to gain prominence in people's virtual interactions, and is becoming increasingly accepted in business communication. 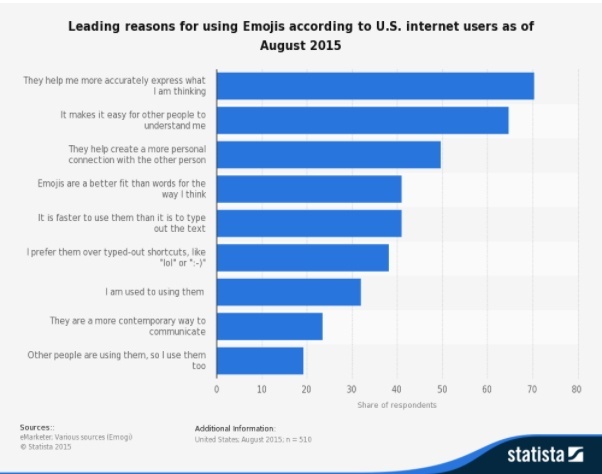 In 2013, 35 percent of US respondents were using app stickers or emojis on a daily basis. The nature of communication has changed drastically especially with the emergence of smartphones. People began to regularly use social media, chat and messaging apps, and with it, came informal, fun and friendly ways of communication. Think emoticons, stickers, gifs, memes and emojis. While emojis have been around for a few years, they hit the peak of their popularity in 2015, when for the Oxford Dictionary chose a pictograph for its Word of the Year - specifically, the emoticon, ‘Face with Tears of Joy’ 😂. There’s even a day dedicated to it - World Emoji Day celebrated on 17 July. Many marketers are now embracing the trend and using it in their branding to drive customer engagement. A famous example is Domino's Pizza, who have successfully innovated by getting customers to order pizza by simply using the pizza emoji. Can emojis really be used to enhance customer service and what is the best way to do so? Here we share some best practices. Before you get on the emoji bandwagon, it is better to err on the side of caution as you must consider what works for your brand, business and audience. For instance, do emojis and quirky icons suit your brand? What tone do you wish to adopt in your customer communication? Serious and matter-of-fact? Or fun and offbeat? How old is your target demographic? - the millennial may be more accepting of it over an older audience who may not be as familiar with them. If you’ve decided to give the go ahead on emoji-use, make sure you select the appropriate channels to use them. For example, social networks and instant messaging are highly emoji-friendly. However, you might want to be cautious while using them in emails, especially if you are sending out a formal notification or responding to a negative email. Just because you’ve decided to use emojis, don’t pepper your conversation with them with no sense of who your customer is. It would be wise to gauge your customer’s tone when you interact with them, be it live chat, Messenger or email. If they are formal in their dealings with you or do not use emoticons in their everyday, it might be better to reflect that in response. It goes without saying, but do not communicate with emoticons when you are dealing with an irate or upset customer or in response to a negative review or complaint as this could backfire and you could end up looking insensitive or unprofessional. Using emojis are a way to soften an otherwise routine customer service interaction. Since much of customer service is being carried out online today, emojis can be treated as ‘online’ body language, which are used to express emotion beyond words. It shows the human side of the person who uses them and can help to infuse friendliness into a conversation, be it over chat support or email. Which of the following sound friendlier in tone? Customer support rep: No problem. Glad I could help. It’s better to take the minimalist approach with emojis and use them sparingly at first until you’ve gotten the hang of when and how to use them cleverly. If you’re constantly using emojis, it may seem frivolous and unnecessary. Remember that you want to enhance customer experience, and the last thing you want is to sound artificial by using them at irrelevant times. If you’re not sure whether it is appropriate and relevant to do so, it is better without. There’s always room for misinterpretation when it comes to emojis. The smiley ‘hearts in eyes’ or the ‘winking face’ emoji are both positive, but can be misconstrued as patronising or express a double meaning. Remember that if it doesn’t come naturally, you’re probably better off skipping it. Remember that different devices and social media platforms sometimes use a variation of the same emoji, so take this into account when you instruct customer support reps on their use. It’s important for any company to keep up with new trends in the virtual world, particularly if your target audience lives online. Now that you’ve seen how emojis can be used to increase customer engagement, why not give it a shot and see how it can increase customer satisfaction? In your email support or efforts, try testing emojis with your customers by using A/B testing in the subject line of your email. This allows you to send an email with and without an emoji to two groups of customers. If your audience responds positively and you see higher open rates, then you know that it works for the fact, and you can now train your team and experiment with different emojis to use it to drive customer engagement.